As British Petroleum continues to struggle plugging the hole they made in the Gulf, I keep seeing ridiculous debates on my Facebook newsfeed about exactly who is to blame for our nation’s biggest environmental catastrophe. Some blame BP’s exploitation of government loopholes and a series of mistakes, others say it was environmental regulations that pushed them that far out in the Gulf to begin with. As it turns out though, they’re all wrong. Physics is truly to blame. Methane hydrates, also known as fire ice, were thought to be confined to the outer reaches of the solar system until fairly recently. It’s most abundant in places like the icy moons of Uranus and Saturn. As BP is now well aware though, they also exist in significant deposits under our ocean floor and form readily in cold, deep water. You can see in the video below, the sea floor under the Deep Water Horizon is full of methane (the lighter stuff coming out with the oil). Reviewing our physics of pressure… If you apply the right conditions to a gas, like exposing it to extreme cold or high pressure, it can take on remarkably unexpected properties. When methane and water are at such extreme depths (the leak is nearly a mile below the surface) the sea water molecules bond to create a cage structure around methane gas molecules that's similar to ice. This crystalline cage is formed by the complex interactions between water and methane, which also allows them to take on solid form at a much higher temperature than either could independently. 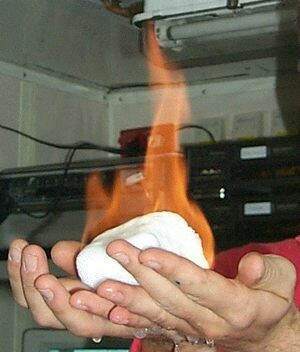 When methane and water do mix like this, you get methane hydrate. Ordinarily, you’d need much lower temperatures for this to happen, but because BP was drilling in such deep waters it was obvious that hydrates would form. So, in early May when BP first suggested it would try to stop the leak by dropping a giant containment dome on top of it, I’m guessing there were a lot of sophomore physics/engineering students that doubted them (or at least their professors). In BP’s defense, they did anticipate methane hydrates clogging their dome and giving it buoyancy, just not enough. However, then they tried it again the next week with a smaller dome, and then again a few days ago with a different shape of dome and then they tried to cut the pipe and cap it yesterday-you get the picture. Let's hope they were more awake than I was in my 9 a.m. second semester physics course. USGS: What is a gas hydrate? WHy dont they drill in shallow water? Is it because there isnt any oil in the shallo water? Is there more oil in the deaper water? No Because people don't want to see the oil rigs when they are at the beach. Its that simple. So many people about the environmental destruction but a hurricane that happens more frequently does more damage, destruction and death to natural species than this oil spill will. Also, there is going to be a huge drop in unemployement because of the people needed to fix this problem. What I dont' understand is why there isnt a manual shut off valve down inside the blow out preventer and why they simply cant take of the bolted flange and replace it with another pipe? Maybe the ROV's cant install and remove bolted items?? not sure there. If you look to the BP web site. They have had a 4 month plan early on and everything they have tried when failed is being used int he next step of the process. I was reading that James Cameron wanted to go down because he could help and others want the Navy's nuclear subs to go down as well. Maybe we should call willie the whale too!